You will be near to Walt Disney World and to great golf as this home is located in the prestigious new Champions Gate development, close to Orlando parks and just off Highway 27 and Highway 192. 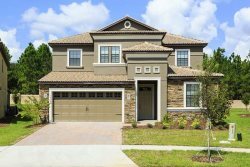 A quick drive to Disney (12 miles), and only a few minutes from Interstate 4 to get to Universal, this is the ideal base for a great Orlando vacation. This 6 bedroom home boasts over 3,348 square feet of pure luxury living for you and your family to relax and unwind from long days at the park. Pull into the driveway of your new home away from home. This home has a large open floor plan easy for entertaining large families, and groups. The living area features a large and comfortable extended sectional sofa surrounding the large LCD TV, perfectly positioned for your large group. Adjacent is the large dining area with seating for 10, and the gourmet kitchen, which is fully equipped with all the appliances, cookware, dishes, utensils and glasses you need to feed your family, and fitted with granite countertops and stainless steel appliances. The home also provides free high-speed Internet and free domestic phone calls so you can easily stay in touch with friends. The home also offers a washer and dryer so you can keep your family in clean clothes. The property has two King Master Bedrooms one located on the second floor, and the other is on the ground floor. Both have en suite baths with walk-in showers and garden tubs for soaking. There is a queen size bedroom located on the second floor for added convenience great for older children or teens, with Jack & Jill bathroom to the twin/full bunk bedroom room. This set up is perfect for a small family to have their own suite. Two other rooms complete the second floor, two with twin size beds. Both rooms are character themed rooms to give the kids the full theme park experience. The kids are going to love the Mickey cartoon and Monster's University themes of these bedrooms! To complete your experience outside, through the sliding glass doors you will find an inviting covered patio deck space complete with pool, as well as an outside dining table with chairs and sun loungers. With all of this and more, this home provides everything you need to relax and enjoy your Florida vacation in style. The Oasis Club, which is a multi-million dollar luxury resort where guests can have access to and then enjoy the clubhouse with restaurant, fitness center, arcade, business center and sundry shop. The amenities do not stop once your inside: enjoy the zero entry pool with lazy river, splash pad, cabanas, sand volleyball and even a poolside bar. Moreover, do not forget to try your golfing skills at the famous 18-hole Champions Gate Golf Course within the resort, as well as play with the entire family at the brand new just released Tennis Courts. You will love the location of this paradise at Champions Gate, minutes from Walt Disney World's theme parks. This resort is near restaurants, grocery stores, and shopping. All of Orlando's many attractions are just a short drive away. Book Paradise at Champion's Gate today! The Retreat is one of the newest prestigious areas of development at Champions Gate. Close to Disney & Reunion. It has a great location with easy access from Highways 192 and 27 and easy access to the Interstate 4. Just minutes from world renown theme parks and entertainment centers. Resort Style Pool with Water Slide and Cabanas, Lazy River, Tiki Bar, Fitness Center, Movie Theater, Game Room, Play Ground, Volleyball Courts, Public 18-hole golf course with a driving range and putting green Golf clubhouse and pro shop and 6 clay tennis courts along with a tennis clubhouse. We loved renting our house from reunion vacation homes. First and foremost safety. It’s a gated community. The houses are very spacious and each one has their own pool. Clubhouse amenities are awesome. Staff is friendly. Loved this place!